My Kit of the Month Club pages are all about Fall with a bit of a non-traditional twist, using the bold and brilliant colors in Close To My Heart's Flirty papers and complements. My Kit of the Month is $20 per month (plus shipping). You can sign up for your 12-month cycle at any time. Just hop on in! Each month you receive two 2-page layouts that are simple enough for the beginner or perfect for the quick scrapbooker. All materials are included in the kit as well as photos, directions, and tips for assembly. The idea behind MY kit of the month is to keep it simple but pretty; easy enough to do in under two hours. Each month is themed to the season too, so you are always up to date throughout the year. Contact me today if you'd like to join my Kit of the Month Club at AnnetteGreen@me.com. Here are a few close-ups of those fun complements. I added some sparkle gems and Liquid Glass to dress up the pages even further. 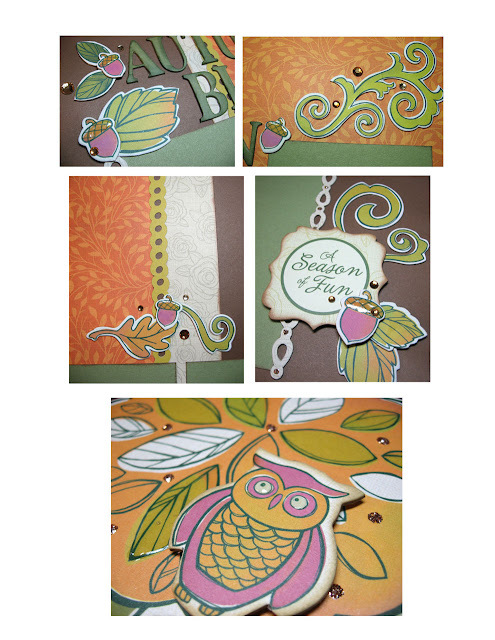 What a great use of the Flirty paper pack! So creative.